Taipei, Sept. 19 (CNA) The development of the Chinese thousands of years of history was based on a trend of "inward transcendence," as opposed to an "outward transcendence" in Western cultures, the first recipient of the Tang Prize in Sinology said Friday in Taipei. 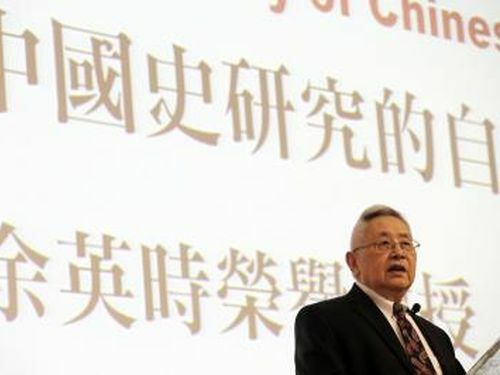 In a speech, the Chinese American historian Yu Ying-shih shared the focus of his 60-plus years of research on the development of Chinese history and highlighted the significant stages over the years. He said there are two main approaches to the perspective of "scientific history" -- analysis based on a single event, as advocated by Fu Sinian, a Chinese educator and linguist who was influenced by German historian Leopold von Ranke; and emphasis on the overall transformation, led by Marxism. "The two branches have had a major influence on me," said the 84-year-old Princeton University emeritus professor. In his study of sinology, Yu said, he has been focusing on the internal development and the unique characters in Chinese history. In his opinion, he said, Chinese history was developed on a trend of "inward transcendence," while Western cultures were developed on the principle of "external, outward transcendence." "The transformation in each generation is the main focus of my research," Yu said during the 50-minute speech. He cited the examples of the Three Kingdoms (220-280 A.D.), Jin Dynasty (265-420), and Southern and Northern Dynasties (420-589), which immediately followed the fall of the Han Dynasty. During that era, there was a big clash between individual consciousness and group consciousness, he said. "Amid the conflicts, everyone tried to find a balance," he added. Another focus of his research was the Song Dynasty, which is seen by many historians as one of the freest periods in Chinese history, Yu told the audience. A significant change also occurred between the Ming Dynasty (1368-1644) and Qing Dynasty (1644-1912), when businessmen gained increasing importance in the society, he said. Chinese civilization was developed individually, he said, stressing that it is not appropriate to analyze Chinese history by using a Western model. Yu is known particularly for his research on the tradition of public intellectuals and the evolution of their identities and status. In a breakthrough research project, he counted the Buddhist monks of the Northern and Southern dynasties and Sui and Tang dynasties among the public intellectuals, a pioneering concept at the time of its publication. Yu's research on major Chinese intellectuals, including Fang Yizhi and Zhu Xi, has also reshaped the way scholars understand these figures in Chinese history. The Tang Prize was established in 2012 by Taiwanese entrepreneur Samuel Yin to honor leading lights from around the world in four fields: sustainable development, biopharmaceutical science, sinology and rule of law. Winners of the award are selected by panels of judges convened by Academia Sinica, Taiwan's top research institute. The panels comprise prominent researchers and scholars from Taiwan and abroad, including Nobel laureates. The biennial prize takes its name from the Tang Dynasty (618-907 A.D.), a period considered to be the height of classical Chinese civilization, characterized by liberal policies and robust cultural activity.